Are you a technology company looking for high caliber talent for your professional, consulting or support services teams? If so, we can help. 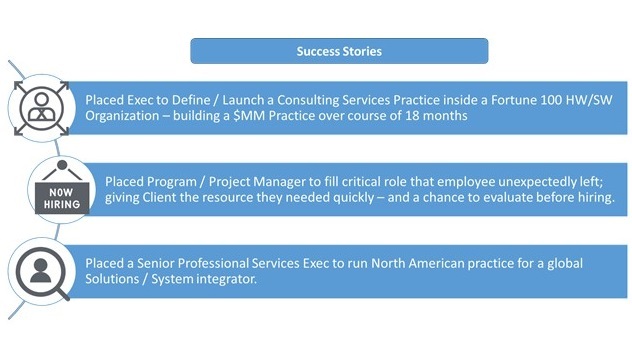 RTM Consulting’s Premier Resource Network (PRN) is a specialized talent acquisition service designed to support your most critical resourcing needs with hand-selected professionals whom we know and trust. We have all been there, you need to find new leadership, locate a particular or hard to find skill set, or just find some temporary help, but have found the ‘highly skilled resources‘ available through traditional recruiting sources rarely live up to their billing. According to the Society of HR Management, the cost of a bad hire can sometimes be as much as 5x the annual salary of that person! RTM Consulting has a solution – our Premier Resource Network (PRN). PRN is a specialized talent acquisition service designed to support your most critical resourcing needs with top-tier service professionals hand-selected by RTMC – professionals we know well enough to endorse and stand behind. Based on our work with some of the world’s leading professional, consulting and support services teams, combined with the deep industry experience of our leadership team, we have developed relationships with a number of extremely high-caliber services professionals whom we can attest are of the highest caliber for your most demanding staffing needs. Hand-selected for their proven talent and experience, these professionals are now available to you through RTM Consulting’s Premier Resource Network. When we conduct a search for you, we start by leveraging our deep understanding of what a candidate needs in order to be successful in the services role you need to fill. Then we access our proprietary network of services professionals we have previously worked with, know and trust, to identify potential candidates quickly. Each candidate is vetted using our exclusive scenario-based approach to interviewing and testing the candidates’ working knowledge and experience specific to your needs. When you need help filling a particular need, contact us at PRN@rtmconsulting.net. We will use our extensive network of top-tier services professionals to identify the resource(s) we know and trust to fill your most demanding needs. Also, visit PremierResourceNetwork.com and join the PRN LinkedIn Group for continuous updates on new resources and opportunities. Click here for a downloadable brochure on the Premier Resource Network. Click Here to see some of our highest priority open roles. Click Here if you are interested in joining the Premier Resource Network.